This is "Little Guy's" mother taken a year before. She pulled this springbok down at Houmoed water hole in Kgalagadi and then dragged it over 500 m over a dune. A spectacular sighting and experience. 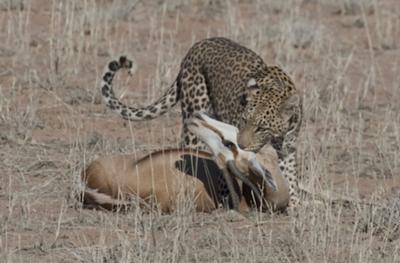 I know so many people have been visiting parks like the Kalahari and Kruger for years and have never seen a kill. Irvine, do you know how fortunate you are!? VWD on getting a superb photo. This is the picture most photographers dream about! Just a leopard lolling in a tree is exciting but a leopard with a kill and in the open - too good! Join in and write your own page! It's easy to do. How? Simply click here to return to Share Your interesting Kalahari story with us!.